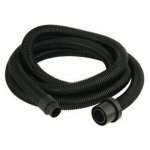 Flexible suction hose for Mirka Abranet Telescopic Pole Sander connecting the sander and the dust extractor. Please note that this hose is conical. The benefit of having a conical dust extractor hose is that it improves the dust suction.